LONDON--(BUSINESS WIRE)--The latest market research report by Technavio on the global jockey boxes market predicts a CAGR of more than 6% during the period 2018-2022. 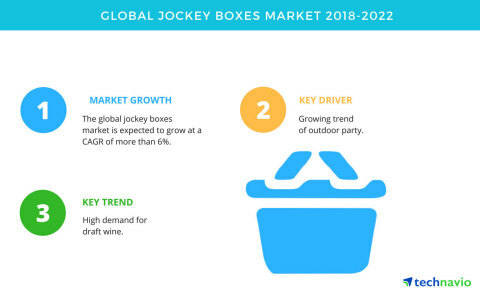 The report segments the global jockey boxes market by product (coil cooler and cold-plate cooler), by end-user (commercial and residential), and by geography (the Americas, EMEA, and APAC). It provides a detailed illustration of the major factors influencing the market, including drivers, opportunities, trends, and industry-specific challenges. The growing trend of outdoor party is one of the major factors driving the global jockey boxes market. The major dilemma for party organizers is carrying drinks and beverages maintaining proper temperature. This requires them to be stored in a cool place. Depending on the place and venue of the event, the preference for keeping drinks cold is not easy, particularly for outdoor parties. Locations where electricity supply is not sufficient to keep the chiller running, people prefer jockey boxes that are simple and convenient to carry beverages to outdoor locations. The demand for draft wine has been increasing rapidly because the increasing premium offers in the wine category are driving interest among customers who also look for the story influencing the introduction of these products or brands. This growing demand for premium on-trade wines is driven by consumers demanding offers led by experience, winemaker's dinners, and themed wine nights. These wine nights and winemakers showcase artistic jockey boxes in their marketing campaigns. This boosts the demand for wines and consecutively drives the demand for showcased jockey boxes. With a share of approximately 48%, the Americas was the largest regional segment of the global market in 2017. It was followed by EMEA and APAC respectively. The US, Canada, and Brazil were the major contributors in the Americas because of the significant increase in the demand for craft beer that consecutively increased the adoption of jockey boxes in the region. The changing lifestyles and increase in camping activities also support the growth of the market in the region. The latest market research report by Technavio on the global jockey boxes market predicts a CAGR of more than 6% during the period 2018-2022.